This was an epic year for me with my longest and most dedicated storm chasing to date. I drove hundreds of miles on back to back days and spent a lot of time and money in pursuit of storms. Highlights include a severe thunderstorm chase all across N. Ireland, storms and funnel cloud intercepts in Co. Fermanagh, storm chasing with TV crew and an unforgettable night at Mullaghmore (longest chase) watching an astounding lightning display among the stars from supercell thunderstorms over the ocean. Add to this an epic coastal sunrise, heat wave, wild fires, comet C/2011 L4 Pan-STARRS, aurora outbursts, insane blizzard, 20ft snow drifts, massive icicles, moonlit snow scenes and an all-night storm chase filming for 'The Longest Night' television program with Alleycats productions to end the year. Amazing memories packed into 19 reports on here. My longest write up to date documenting three night time storm chases along the Co. Antrim coast On Dec 16th and 19th then climaxing on Dec 21st with an epic all-night dusk to dawn photo shoot with a film crew from Alleycats TV recording my every move for a new BBC television program called 'The Longest Night'. The report documents this thrilling adventure from Downhill Beach to Dunluce Castle then peaking before dawn at Ballintoy Harbour as we battled with the wind, rain, sleet & snow to get rewarded with wonderful scenes of moonlit waves, convection and a shadow-casting Iridium Flare with stunning episodes of ocean lightning as the Atlantic raged all night long making for a truly unforgettable night. One page report with 35 images. - REPORT. 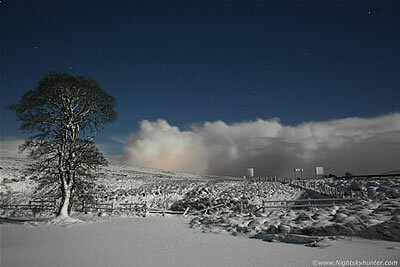 Stunning all night photo shoot on Glenshane Pass and Benbradagh mountain in Dungiven on November 18th/19th 2013 where Paul Martin and I spent over 9 hours photographing moonlit snow and stars during the first taste of Winter when a brief Arctic blast brought the first high level snow of the season to N. Ireland. Visually it was an epic night standing under the stars in a -8 degree C wind chill with constant snow showers, convection, and even rare thundersnow while the white mountain landscape glowed like Narnia under the surreal moonlight. One page report with 20 images. - REPORT. Thrilling aurora shoot at the north coast of N. Ireland on Halloween Eve 2013 when a CME associated with an M-class solar flare hit Earth's magnetic field a glancing blow increasing geomagnetic activity. However once the IMF tilted south a major aurora outburst unfolded across the ocean horizon which last for 15-20 min's, the outburst was over 40 degrees high and exhibited remarkable ray activity which I observed with Paul Martin and another photographer. 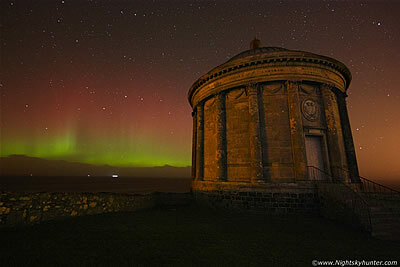 I photographed the stunning visual apparition over the famous Mussenden Temple above Downhill Beach. This outburst made up for the entire year making for an unforgettable Halloween experience. One page report with 5 images & 1 video blog. - REPORT. 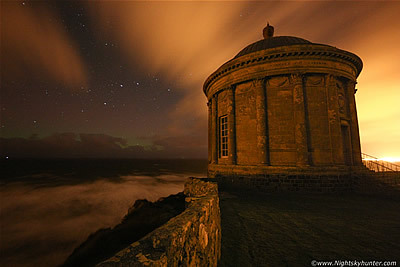 A fun and challenging night on the north coast of N. Ireland on October 9th/10th 2013 with photographer Paul Martin shooting a CME-induced faint aurora display over the famous ruins of Mussenden Temple near Downhill Beach captured in harsh conditions due to gale force winds. This was my 114th aurora sighting and although it was faint it was still lovely to witness from this magical location up close and personal with this historic building at night. One page report with 3 images. - REPORT. One of the most thrilling and rewarding storm chases I have ever experienced on August 1st 2013 in the hunt for supercells and tornadoes. 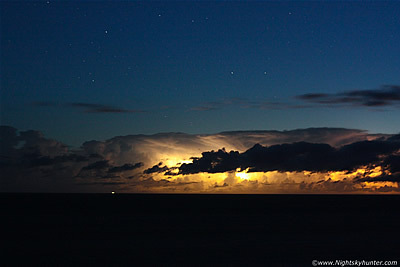 Paul Martin and I chased to the W coast of Ireland in Co. Sligo and as darkness fell over Mullaghmore we got treated to an epic 2 hour lightning display from a line of massive severe thunderstorm cells located over 80 miles away over the ocean. We counted more than 500 lightning bolts of every variety and were stunned by anvil crawlers which illuminated mammatus, anvils and overshooting tops with the entire storm structures lit up from within and surrounded by stars making for an incredible night of action. 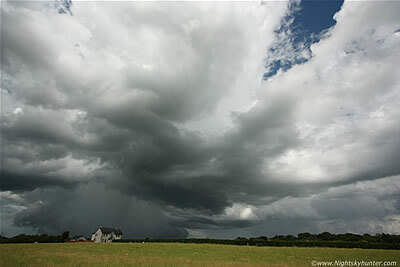 This was the climax of the current thundery breakdown with 1175 miles covered and 22 hours on location. One page report with 28 images & 1 video slide show. - REPORT. Short report covering thunderstorm encounters over Belfast city on the weekend of July 28th and 29th 2013. The report documents a massive storm on the 28th which we attempted to chase, this storm went on to produce severe flooding in Magherafelt and Draperstown. 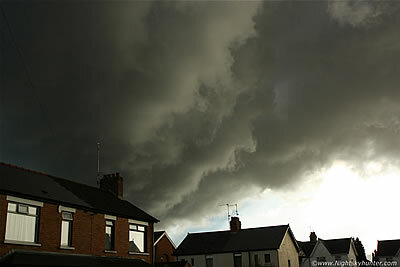 The highlight however was the late evening thunderstorm over S. Belfast on the 29th which sported the most dramatic thunderstorm updraught base I have ever seen as it passed over the rooftops of city homes before sunset with churning motion and thunder. One page report with 9 images and 2 extensive video clips. - REPORT. A fun local storm chase on July 26th 2013 when my Dad and I chased a beautiful single cell thunderstorm through the countryside between Swatragh and Garvagh which had lovely cloud structure while sporting a very concentrated and intense precip core with rare 'rain foot' outflow feature which looked fantastic over the sunlit fields. 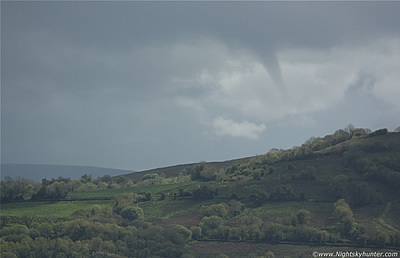 The chase ended with a high based funnel cloud over the same area followed by another storm encounter over Glenshane Pass where I later learned a possible tornado may have touched down. This was my fifth day in a row of storm chasing. One page report with 12 images and 1 video clip. - REPORT. My longest storm report to date covering a remarkable period of weather between July and early August 2013 featuring a two week heat wave followed by another two weeks of thunderstorms. This was an intense period of chasing every day with little sleep and almost 1200 miles covered including multiple trips to Fermanagh, BBC filming, and documenting the entire emotional roller coaster ride which I experienced with busts and thrills in equal measure. The report is centred on the July 25th chase when Paul Martin and I chased a severe thunderstorm all across the country which produced car-shaking thunder and close range lightning making for an epic storm chase adventure. One page report with 29 images & 3 video clips. - REPORT. 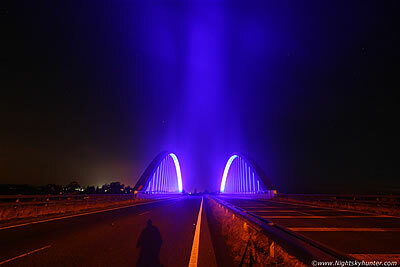 New images of Toome Bridge at night taken on July 19th 2013 added to an existing report featuring a selection of night landscape photography of this famous local bridge at various times of the year under differing atmospheric conditions. The latest edition features 10mm ultra wide angle images of the bridge from new angles and head-on shots taken from the middle of the carriageway on a quiet warm and humid Summer's night during the middle of a heat wave. - REPORT. N. Ireland was in the middle of a heat wave and I was meant to be storm chasing on June 5th 2013 when I got distracted on the road by distant smoke so I changed my plans and chased after this instead. In the Co. Tyrone area between Omagh and Cookstown I encountered the largest inland gorse fire of the season which would rage all day long extending 5 miles in length and battled by 50 fire fighters. 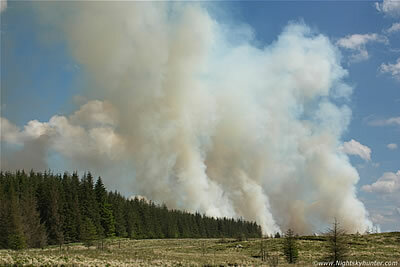 The fire was nasty and exhibited spectacular smoke plumes which generated rare pyrocumulus clouds followed by rotating smokenadoes, if this wasn't enough I also observed a horse shoe vortex and 3 dust devils near Beaghmore Stone Circles making for an action packed, exciting, and very hot photo shoot. One page report with 25 images and 1 video clip. - REPORT. On May 28th 2013 I completed my second storm chase to Co. Fermanagh which turned out to be my longest chase to date with 150 miles done and 11 hours on the road. 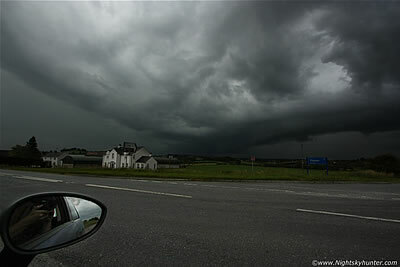 The chase was an absolute success when I captured a large convergence zone funnel cloud in the direction of Enniskillen at 15.00 which lasted for 5 min's in duration. During the evening I met up with chaser Paul Martin and together we observed 3 more funnel clouds over Omagh which brought the count to 4 funnel captures in a single day. This was a great road trip with excellent weather and wonderful scenery. One page report with 15 images and 1 video clip. - REPORT. 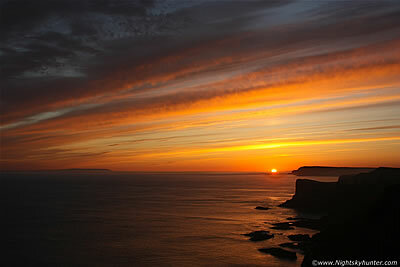 A fantastic all night photo shoot at the Co. Antrim coast with Paul Martin from dusk until dawn. What started out as an uninspiring overcast NLC and aurora hunt turned into an atmospheric Dunluce Castle shoot followed by a spectacular sunrise which took us completely by surprise. We observed and photographed the spectacle from the vast cliff tops outside Portrush where we watched with awe as the much of the sky was covered in stunning vivid red, pink, yellow, blue and gold colours which seemed to last for an eternity which then climaxed with the sun's disk slowly climbing over the flat ocean horizon casting the ocean into a heavenly gold colour. This was the best sunrise any of us had ever seen which made for an unforgettable experience. One page report with 16 images and 1 video clip. - REPORT. Large report which begins with some of my early comet memories followed by the discovery and massive build up to the 2013 C/2011 L4 Pan-STARRS comet apparition. 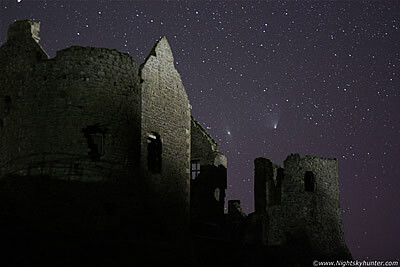 This report documents the hardships as I battled against cold and cloudy skies in search of this exciting new visitor which took me from Cookstown to Glenshane Pass and from frustration and sadness to spectacular thrills as the hunt climaxed with two unforgettable nights shooting this beautiful comet over the Co. Antrim coast with the amazing Pan-STARRS and M31 close conjunction showing off over the Giant's Causeway and Dunluce Castle. 34 images & 1 video clip - REPORT. 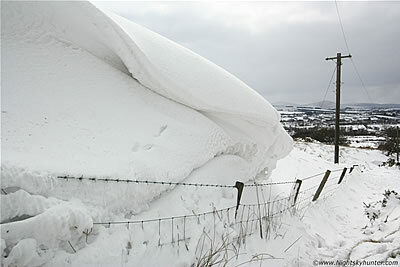 Historic extreme Winter weather event across N. Ireland during March 2013 when stalling Atlantic frontal systems encountered freezing air from Europe which resulted in 36-48hrs of continuous snowfall with gales producing blizzard conditions which produced the worst snow storm for 50 years with power lines disabled, ice storms, blizzards, massive snow drifts & the death of over 10,000 Sheep and Lambs. This report covers the amazing blowing snow on Glenshane Pass then the aftermath at Dungiven, Lough Fea and the Sperrins where I encountered incredible 20ft deep snow drifts, deep ploughed snow on the roads, and icicle displays. One page report with 31 images & 3 video clips. - REPORT. Winter 2013 Part 2 - Detailed image report covering the period from Jan 31st to Feb 5th following various chases through Maghera, Gulladuff, along the Co. Antrim coast, then Glenshane pass. 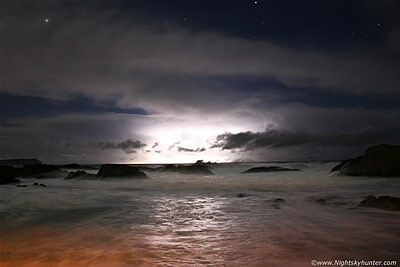 During this period I chased severe Winter weather and intercepted powerful day and night squalls of hail, snow, and sea foam accompanied by violent gusts of wind followed by a display of hundreds of icicles and glaze ice on the Sperrins - the second such time this dramatic spectacle has happened within 14 days - and observed distant thundersnow cells. One page report with 17 images & 4 video clips. - REPORT. 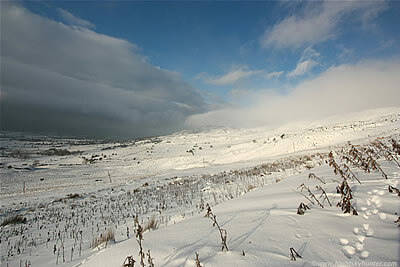 Day 5 part 2 of the current severe Winter weather event in N. Ireland on Jan 22nd 2013. I spent the afternoon hiking up the steep snow-covered slopes of Benbradagh along the Sperrin Mountains outside Dungiven when after days of overcast skies the clouds parted to reveal a stunning Winter landscape with bright sunlit snow-covered mountain and crisp blue skies aloft contrasting with dark snow clouds and blowing fog over the beautiful summit which made for an unforgettable experience. One page report with 13 images and 1 video clip. - REPORT. 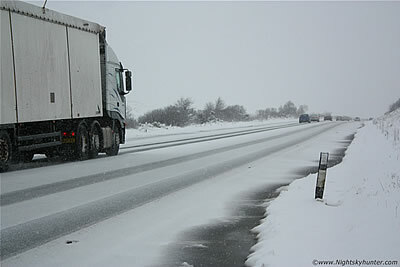 Day 5 part 1 of the current severe Winter weather event in N. Ireland on Jan 22nd 2013. After encountering heavy snowfalls, freezing fog, and hoar frost I suddenly encountered a remarkable sight on the main road along Glenshane Pass. Hanging from the mountain cliffs where literally hundreds of massive icicles and slabs of ice covering the rocks, grass, and blending into the snow drifts. 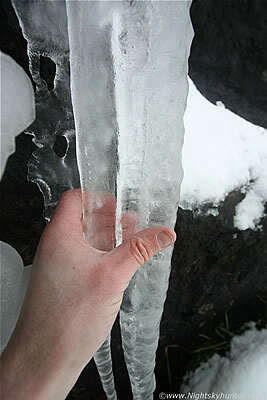 I measured one icicle at 3ft in length & 5"-6" thick of solid clear ice making for a truly insane Winter experience which made for an unforgettable day. One page report with 19 images and 1 video clip. - REPORT. 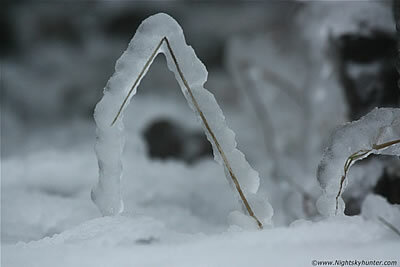 Day 2 part 2 of the severe Winter cold spell affecting N. Ireland on January 19th 2013. 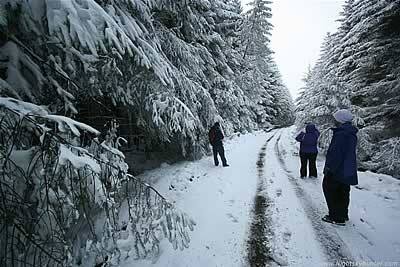 After spending the entire day with my girlfriend driving in snow we later met up with my Dad and his friend at last light and went for a long walk through the beautiful snow-covered conifer and pine trees in Glenshane Forest which made for a very special memory. The experience of the heavy snow causing the vast tree branches to sag combined with the absolute silence and freezing temps in eerie light made for a wonderful experience. One page report with 10 images and 1 video clip. - REPORT. Day 1, day 2 part 1, and day 3 of the severe Winter cold spell affecting N. Ireland from Jan 18th to Jan 21st 2013. This extensive report covers many trips across the Sperrins at Glenshane Pass and Dungiven which features a blizzard, blowing snow, 4.5ft snow drifts, glaze ice, 1ft long icicles and snow rime ice complete with snow road scenes. Two page report with 32 images and 3 video clips. - PAGE 1, PAGE 2.